I know Dara O’Briain from QI and envy him this opportunity to meet his (and my) hero. Those who receive my business card (a post card with the illustration of one of my paintings shown below) know how much of a fan I am. The painting is titled “Black Hole” and is a 2D representation of Hawking Radiation. It is executed on black velvet and has, in the background in flat black paint, images of Einstein and Newton. Painted outside in direct sunlight, they are invisible except under very bright light. 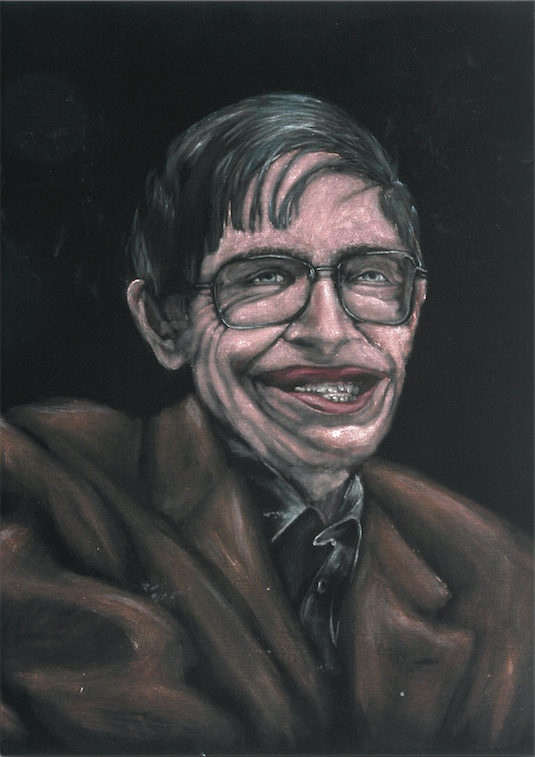 Dr Hawking’s image, the reflected light of which is always visible, is a metaphor for the only energy to escape the black hole represented by the velvet. I sent Dr Hawking a color copy of the painting and still have the letter I received in response.